A locomotive going off the rails provides an accurate visual metaphor for Murder on the Orient Express, Kenneth Branagh’s dry, nearly-interminable stab at the classic Agatha Christie mystery, the first time in over forty years it’s been on the big screen. From Michael Green’s script, Branagh directs a star-studded ensemble of luxury railway travellers and potential murderers, including Johnny Depp, Daisy Ridley and Michelle Pfieffer, and well-heeled British thespians Derek Jacobi and Judi Dench. 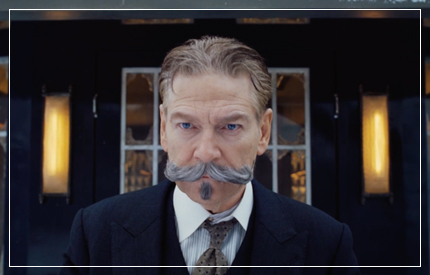 Branagh also stars as the world’s greatest detective himself, Hercule Poirot, complete with a panto Belgian accent and an absolute shocker of a moustache. Poirot, just off a difficult case, is trying to have a relaxing time on a nice train, but there’s been a murder in the middle of the night, and everyone is a suspect. A shady American art dealer (Depp) is found in his cabin stabbed to death and the list of suspects includes the entire passenger log. Under suspicion are the dead man’s unscrupulous assistant (Josh Gad), his valet (Jacobi), a brash, chatty divorcee (Pfieffer), a reticent Austrian professor (William Dafoe), a black British doctor (Leslie Odom Jr), a governess from the colonies (Daisy Ridley), a regal dignitary (Judi Dench) and her servant (Olivia Williams), a pious nurse (Penélope Cruz) and a fiery Greek couple. When the train is derailed by the snowstorm, the occupants are stranded with nothing to do but wait on help and eye eachother nervously, as Poirot goes through them one by one, trying to establish motive and weave together curiously interlinked backstories. In terms of suspense, the train never leaves the station. There is a certain sheen to the photography and a fascination with the luxury bric-a-bac of expensive transport, a transparent production style with no shadowy pockets for guilt and secrets to hide. The script doesn’t allot enough time for the personalities of characters to develop, so there’s a limited sense of resistance in Poirot’s sleuthing. The pieces come together with a weird ease. Orient Express’ problems are much the same that dogged Branagh’s lavish Shakespeare adaptations of the 1990s; adaptive reverence and a self-conscious kind of performance that makes it all about him. In almost everything he does, Branagh brings with him the Belfast boards on which he got his start. Murder on the Orient Express is silly (that moustache! ), but not the fun, light kind of silly. A troupe of noted names hamming up Christie would’ve offered some pleasures, but Branagh’s distant direction doesn’t throw much coal in the fire. The film just doesn’t provide a compelling alternative to the camp of the 1974 film, a comparably eye-turning ensemble that included Ingrid Bergman, Lauren Bacall and Sean Connery, or the dignified melancholy of the long-running ITV series. Pfieffer at least has a bit of life to her, but everyone else just seems to sit in the carriages, static and one-dimensional like Cluedo types subject to the story’s brisk processes of elimination. The Orient Express episode of David Suchet’s TV Poirot, broadcast in 2010, closed on a rich moment of loss, compromise and diminished righteousness, as the detective thumbs his rosary beads in the snow, broken by the sordid demands of the case. When Branagh’s investigator gathers his suspects in a Last Supper tableau and delivers his monologue, all it really expresses is how much Branagh likes big speeches. Orient Express is under-constructed and emotionally overreaching, an unconvincing attempt at bankable post-Downton bourgeois intrigue that asks little of its capable performers. It’s a stagey mystery with little appreciation for the mysterious.